Jennifer Gooch Hummer has worked as a script analyst for various talent agencies and major film studios. Her short stories have been published in Miranda Magazine, Our Stories, Glimmertrain and Fish. She has continued graduate studies in the Writer’s Program at UCLA, where she was awarded the Kirkwood Prize in fiction. Currently, Jennifer lives in Southern California and Maine with her husband and their three daughters. Sounds like she has quite a lot of traveling to do! You can learn more about her by visting her website, as well as Facebook and Twitter. 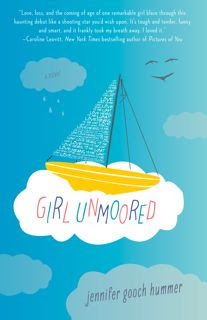 First off, tell us about your awesome book, "Girl Unmoored," and what inspired you to write it. But first, let me thank you so much for having me! Okay, when I was ten years old this girl knocked on my head, introduced herself as “Apron” then crossed her freckly arms, tapped her foot and waited for me to tell her story. I tried. I even turned off The Partridge Family and started, “A Girl Named Apron” in a red spiral notebook (which I still have). Sadly though, the story had no plot – all Apron did was pack up to go live with her grandmother. Years later, when I met my friend Mike, I found Apron’s story. My Mike is not the same as the Mike in the book, but he too flipped his blond hair around, and he too taught me a thing or two about courage. A few reviewers have mentioned that "Girl Unmoored" seems very personal. It is. Put it this way: I made my daughters promise that if I died of old age before I finally got the book published, they were to erase my name and add their own and keep submitting, or else I would haunt them forever. Get sassed by my three dramatic daughters, followed by my overly attached dog and stared at by my adorable husband. I’m a lucky girl. I learned this: Promise your characters you will tell their story. I went through what so many new authors go through before finally getting published. I could wallpaper every bathroom in my entire neighborhood with rejection letters (and I live in LA so that’s a lot of houses). I kept quiet about everything having to do with my book - very few people knew I was even writing one - so that I wouldn’t have to talk about the gut-wrenching process. But I wasn’t going to quit. I promised Apron and Chad and Mike that I would get their story out there, which I know seems insane (okay, it is insane). But it kept me going. When the going gets tough, write for your characters. They showed up, so should you. If “Girl Unmoored” were made into a film, who would you cast in the lead roles? Well first, Shirley MacLaine as Grandma Bramhall...she would be spectacular! A 13 year-old Ellen Page (star of Juno) would be a great Apron. Ewan McGregor has the heart to play Mike. Dennis Quaid as Apron’s father, Dennis (! ), would be great. As for Chad, probably an actor who has not yet made himself a household name. And M? Hmmm. Well the fake mom from Tangled comes to mind. I’ve already told my dad he can play Mr. Orso. What is your favorite place to spend money? High-end home stores, like the ABC Store in New York. We moved into a new house two and a half years ago and still have a room with no furniture in it. Unfortunately, I have expensive taste, so I’d rather gather fantastic things slowly than buy cheaper things to fill up space. What is your favorite spring-themed food? Yes! This is research for one of my next books: Do any of you use Feng Shui in your apartment/house/space? If yes, what kind of remedies do you do, and why? Special thanks to Jennifer for chatting with us and to BookSparks PR for sharing "Girl Unmoored" with our readers. 1. Please answer Jennifer's question: Do any of you use Feng Shui in your apartment/house/space? If yes, what kind of remedies do you do, and why? US only. Giveaway ends April 8th at midnight EST. I've never used Feng Shui in my house but it is interesting. No, even though my family is Chinese we just don't bother. I guess we jus tlike to put our furniture wherever we want them...and we have too much stuff anyway. I have never feng shui'd anything. Too much work. No Feng Shui. I put things places and they stay for years. I am very comfortable with the placement of my things. I feel like we're letting you down in the Feng Shui department! None for me, either. If my space was not so cluttered, I want to explore Fengi Shui. I don't use Feng Shui, but it sounds interesting. no, i don't use feng shui...by my cousin does. Only use feng shui in the sense I use red. So guess that's a no? I do not use Feng Shui. I do not get it. I've heard of Feng Shui, but have never used it.